Thousands of their carcasses have been found floating in the cold water off Cape Cod or rotting on beaches. Many more of the birds have been found emaciated, exhausted, and suffering, often near death. In recent years, a mysterious virus has taken a mounting toll on the region’s common eiders, a normally bulky sea duck considered a barometer for the health of Cape Cod Bay. A team of federal, state, and local officials fanned out across the Boston Harbor Islands this week to capture eiders, hoping to understand why so many of the migratory birds are dying. Two years ago, 95 percent of eiders sampled in the bramble along the islands’ rocky coasts tested positive for the virus, more than anywhere else along the Atlantic coast. More recently, the disease, which was identified in 2007 and has since been dubbed the Wellfleet Bay virus, has been found in other species. Biologists, surgeons, and ornithologists from the Fish & Wildlife Service, National Park Service, state Department of Conservation and Recreation, and state Division of Fisheries & Wildlife have searched for eiders using skiffs in heavy seas and stormy weather. On Tuesday morning, they assembled special nets and decoy ducks to lure five eiders into a trap on Calf Island, where four ducks were roosting that had been captured last year and tagged with tracking devices. Afterward, they attached a special identifying band to the birds’ legs, took blood samples, and locked them in small crates to transport them back to Georges Island, where the team set up a small surgical ward. Veterinarians there administered anesthesia to the birds, inserted breathing tubes, and then removed some of their bright white and black plumage to implant beacons that can be tracked by satellites. The goal was to better understand where the birds are migrating and what might be exposing them to the virus. Chris Dwyer, a biologist with the Fish & Wildlife Service, said about 6,000 eiders have been found dead over the past decade, most near their feeding grounds by Jeremy Point on Wellfleet Bay. The deaths have occurred mainly in the fall, a few hundred at a time. But there have been spikes, such is in 2007, when officials found some 3,000 dead along Jeremy Point. Dwyer said the losses have been steady but don’t appear to be increasing. Between 250,000 and 300,000 common eiders migrate every year along a corridor from the coast of Labrador in Canada, where they breed, to as far south as Long Island Sound, where they feed on mollusks and other crustaceans. The farthest south they breed is the Boston Harbor Islands. Wildlife officials first began noticing premature deaths and sickened eiders in Wellfleet Bay in 1998. Those found alive with the virus tend to be stricken with lethargy, diarrhea, and troubled breathing, as the disease attacks their liver and gallbladder. Scientists believe the virus may be transmitted by ticks or other insects, such as mites or mosquitoes. Other birds that have been found with the virus, including ring-billed gulls and white-winged scoters, have yet to show signs of illness. But Jennifer Ballard, a wildlife disease diagnostician studying the disease at the University of Georgia in Athens, said it is possible the virus had existed in the birds for years but is only being detected now. “It’s too early to say whether the virus is being introduced from an outside source,” said Ballard, who will analyze the blood samples and insects that the team sends from the Harbor Islands. She said the virus is genetically related to a group of viruses found in other migratory sea birds that nest in similarly sized colonies. Identifying the source of the virus, she said, is important because it will help wildlife officials better manage the eider population and maintain balance in the ecosystem. The federal government allows hunters to bag about 30,000 eiders a year. “The overall hope is that once we’ve identified whether this is a normal part of the eider’s ecology or whether it has been introduced, we’ll know whether anything needs to be done,” Ballard said. On Tuesday, after capturing the birds on Calf Island, some of the team left their base on Georges Island and braved the choppy surf for the short trip to Lovells Island, in search of more eiders. The group carried nets and other gear as they scrambled through thick vegetation, along the rocky beaches, and through a warren of old forts in a fruitless search for the elusive ducks, renowned for their valuable down feathers. After a few hours, they boarded their boats empty-handed and returned to Georges Island, hoping the weather would improve and make it easier to capture more birds. Back at their base, the surgeons had finished implanting the transmitters and were ready to free the first eider. Dwyer brought the docile male to a beach, opened the crate, and let him waddle into the water and fly off. “We’re really trying to figure out what this bird is doing,” he said. 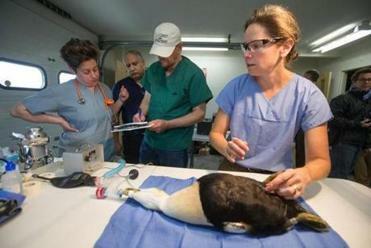 Over the next few days, Dwyer’s team caught 33 more eiders, implanting 19 transmitters in all. They didn’t find any ticks, but Dwyer said they collected soil samples from the nests and enough blood and feathers that he hoped they would yield insight into the cause of the lethal virus.